Students gather on the Lakefill on the night of the 2016 presidential election. One year into Donald Trump’s presidency, students, faculty and staff have voiced concerns with his leadership. Weinberg junior Sammy Cuautle said he knew he was taking a risk by voting for President Donald Trump in the 2016 election, but hoped that other Republican politicians would be able to steer the party in the right direction. 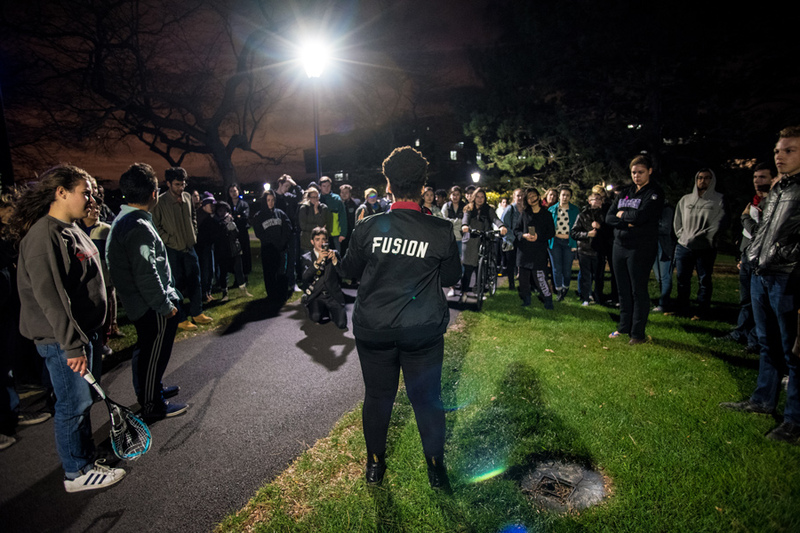 One year after Trump’s controversial election, students across the political spectrum voiced concerns with Trump’s leadership and noticed increased activism on campus, while some faculty said they appreciated the University’s response to recent national policies. Cuautle said on campus, the election has led people from both political sides to become more vocal and politically involved. College Republicans president David Donnelly, who voted for Libertarian candidate Gary Johnson in the election, said the Trump administration has not “gotten a lot done” in the past year. The McCormick senior added that, aside from the first few days of shock after the presidential election, he does not think campus has changed “radically” because of Trump. He said, however, that it was a reminder of the importance of voting. Donnelly said in his four years at NU, it has become increasingly difficult to plan College Republican events due to security concerns and a “political fervor” he partly attributed to Trump’s election. He added that despite this difficulty, the NU community has been particularly tolerant of political differences. College Democrats co-president Calvin Anderson said he was “shocked” when Trump was elected, and that his presidency has continually threatened marginalized communities at Northwestern. Anderson noted student activism around issues such as Trump’s travel ban and immigration rhetoric, citing the reaction to the U.S. Immigration and Customs Enforcement public relations officer who visited campus during Spring Quarter. Though Anderson said the negatives of Trump’s administration and “hateful rhetoric” used by right-wing politicians in the past year outweigh the positives, he added that the election succeeded in disproving the ideal of a “colorblind” society. For Robert Brown, NU’s director of Social Justice Education, Trump has “shined a brighter light” on issues such as sexism, racism and classism. Brown also said the University has upheld its values by being “proactive” in responding to Trump’s policies. Following several of the Trump administration’s policy announcements, such as the travel ban and the proposed end of the Deferred Action for Childhood Arrivals program, University President Morton Schapiro publicly announced support for affected students. Political science Prof. Alvin Tillery, who called the Trump administration “the worst administration in the television age,” said he appreciated the University’s response to national politics. Anderson said while the University has been “responsible” in speaking out about issues that will affect students, he noted there are some more “troubling” things, such as the chairman of the Board of Trustees’ donations to the Trump campaign. He added that College Democrats can use Trump’s election as “fuel for the fire” to continue advocating for Democratic politicians in future elections.